Life can be so busy and we may not always have the time to express our appreciation to our loved ones. Grandbox is a subscription box service geared towards Seniors. Grandbox allows you to customize your subscription box with photos and a letter to your loved ones. 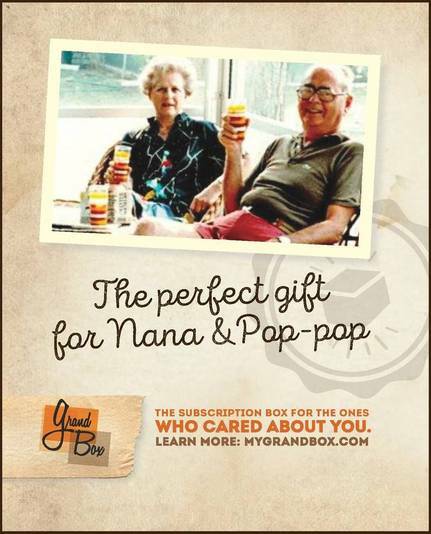 Send grandma and grandpa a GrandBox. The perfect gift for Grandparent's Day or just to show them how much they are loved! GrandBox is a monthly subscription box curated specifically for seniors 65 and up. Each box can be personalized with family photos and a note. It's the perfect gift to bring a smile to your loved ones. I was given the opportunity to send a Grandbox to my loved one. i decided to send it to my Great Aunt. She is very special and dear to me. I wanted to let her know that I was thinking of her. I even sent her a photo of me and of my cat, whom she loves. As soon as she received her package, she called me on the phone to express her gratitude. She said she was so excited to receive a package in the mail. She also said she was looking forward to trying all of her goodies and sharing her maple cookies with her friends. She has game night every week in her Senior Living Apartment, so she can't wait to try Tenzi. She has never heard of it, but wants to learn how to play. I was so happy that I put a smile on her face and made her day through a simple gesture. Click the box below to save on your order. 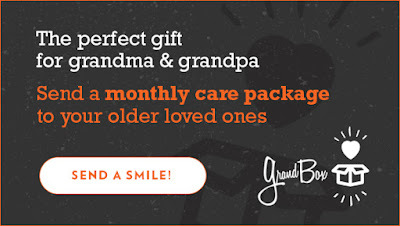 GrandBox is the perfect gift for your older loved ones! Save on your first purchase! Disclosure: I received a Grandbox to send to a loved one in exchange for my opinion. I was not required to write a positive review, however, I did because I think it is a wonderful gesture and it was loved by my recipient.